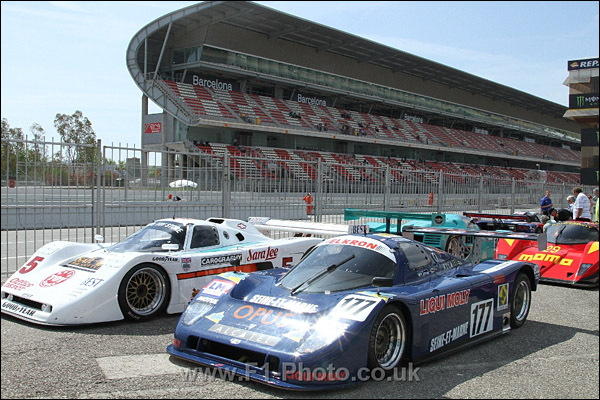 For the third year running the Group C Racing Series kicked off its season with a visit to the Spirit of Montjuïc (aka the Catalunya Classic Revival) meeting at the 4.727km Circuit de Barcelona in Spain. There was a familiar look to the grid, but a closer inspection indicated that an expensive game of musical chairs had been taking place over the winter, with several cars having changed hands. 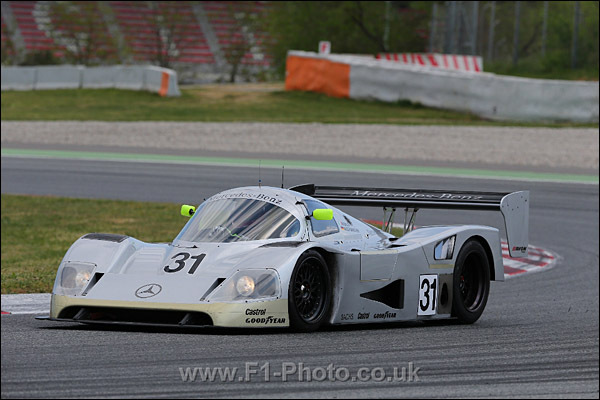 Kriton Lendoudis had acquired the #31 Mercedes C11 from Gareth Evans in time to race it at the final round of the 2014 season, but Christophe D’Ansembourg was now in possession of the 3.5ltr Jaguar XJR14 – also ex-Chamberlain Synergy – and couldn’t wait to start racing it. So what would Gareth Evans be racing in 2015? 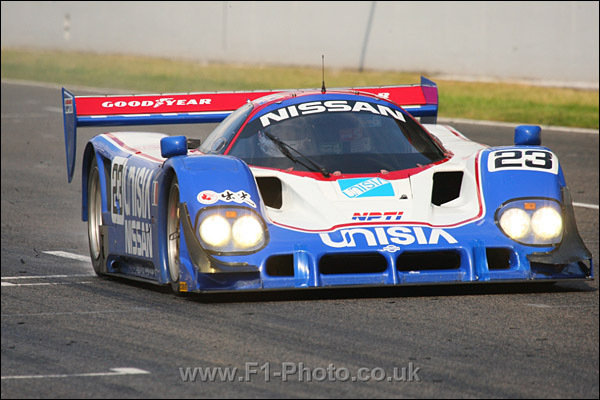 The answer was the #27 FROMA liveried Nissan RC90 that had been sold to him by Steve Tandy. And Tandy? 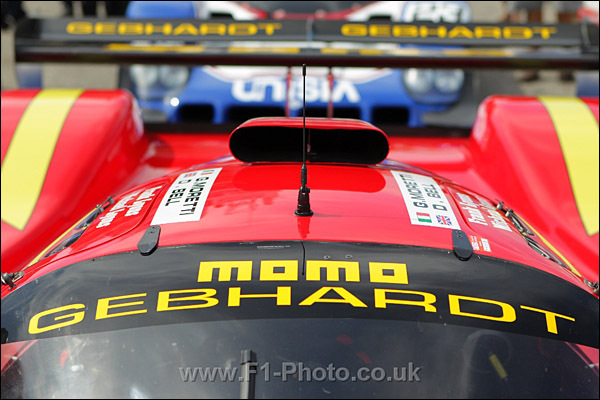 Well, he was back in the series for a full season with his weapon of choice being the #5 Spice SE90GTP that would run in C1. …but this time Michael Lyons would have sole use of the C3 vehicle, owing to the purchase by dad Frank of the C2 class #177 ALD C289; the French car looking fantastic after its winter restoration. 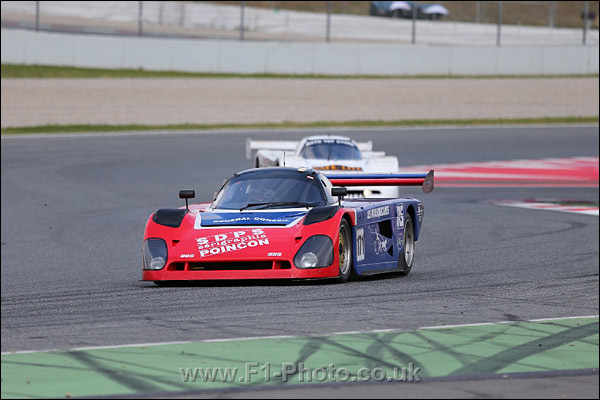 Up against him in Barcelona would be newcomer David Methley in his #171 Spice SE89C. 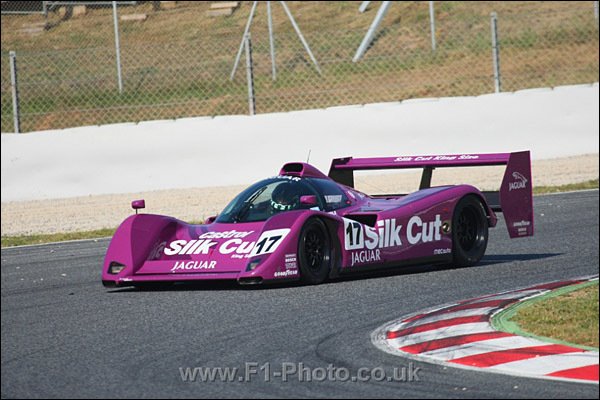 Three of the cars would have second drivers: Hervé Regout would be sharing the Jaguar XJR14; Bob Berridge was in the FROMA Nissan; and Kriton Lendoudis had invited the very rapid and experienced Portuguese racer Rui Águas to share the Mercedes. All three of these drivers would be starting the first of the two races. After testing on Friday, the serious stuff began on Saturday with two 40-minute Qualifying sessions; each one contributing to setting the grid for the two 30-minute races on Sunday. Bob Berridge was the first to set a time in the morning session, with a 1:44.192 appearing on the screens in the fourth minute, before Rui Aguas (1:44.066) and Katsu Kubota (1:43.883) lowered the bar very soon afterwards. One lap later, however, Christophe D’Ansembourg carved a mighty chunk out of the target time and lowered provisional pole to 1:37.992 in the XJR14. 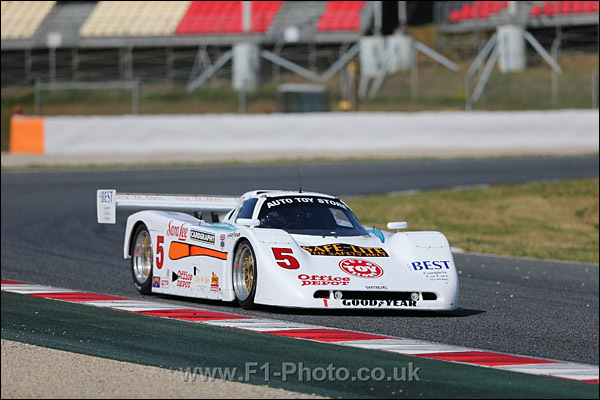 Richard Eyre was the closest to the Belgian at this point, with a 1:40.671 from his XJR16, but it would be another five minutes before anyone else broke the 1:40 barrier; Steve Tandy taking his Spice round in 1:38.424 on his sixth lap. Kubota improved to third on his 10th lap, with a 1:39.790, by which time Regout had improved his own time to 1:37.701, but provisional C1 pole would go to the Mercedes as Rui Águas stopped the clock at 1:38.20 on his 11th lap. 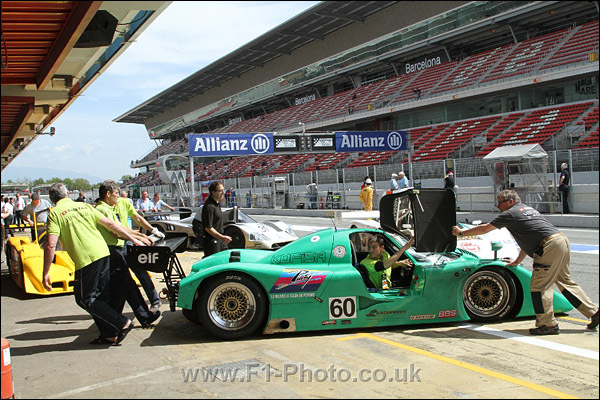 The XJR14 would twice better its time before the 40 minutes were up, leaving provisional pole at 1:36.344, while David Methley had set the fastest C2 time of the day so far, with a 1:46.063 in his spice. The second session began some six hours later in the early evening. 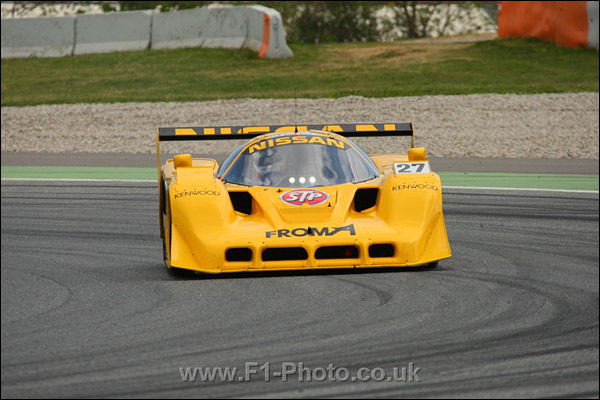 Once again, it was the yellow Nissan that lay down an early marker – a 1:42.779 from Bob Berridge – and this time it would be improved upon by the same car as it sliced a further 1.4s off on its next lap. Just two minutes later, though, Tandy bettered this laptime by 0.044s in the #5 Spice. Kubota’s best came after 12 minutes, but his 1:42.091 was only third fastest at the time – second in C1 – and he ended his session just a lap later. 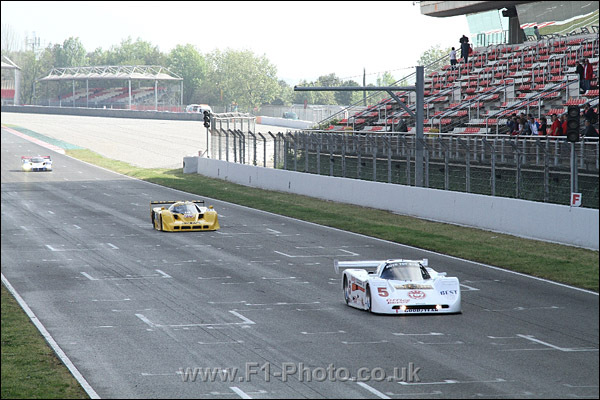 But as the Nissan was being parked, the XJR14 and the C11 were both venturing out for the first time. On this occasion, though, it would be the Mercedes topping the times as Águas went round in 1:38.904 on his third lap and 1:37.994 on his fourth to set the fastest time of the session and secure C1 pole. Christophe D’Ansembourg, in the meantime, was down in the 1:43s and completed just five laps; but this was probably due to C3 and overall pole having been well and truly cemented in the earlier session. 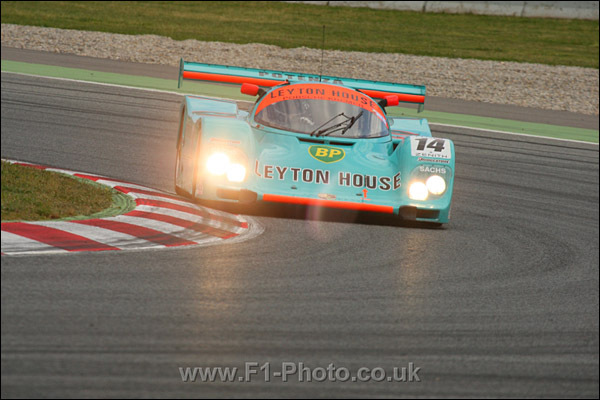 Methley’s 1:45.339 not only gave the #171 Spice C2 pole for the following day’s races, but was also quicker than the Tommy Dreelan Porsche 962 and the Eric Rickenbacher Cheetah, both C1 cars, in the session. 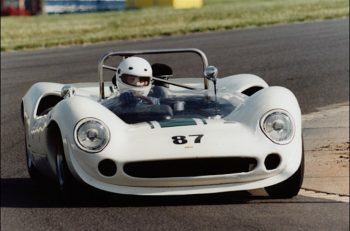 However, Richard Eyre failed to set a time in the session, as his Jaguar managed just three out-and-in laps in the 40 minutes available. 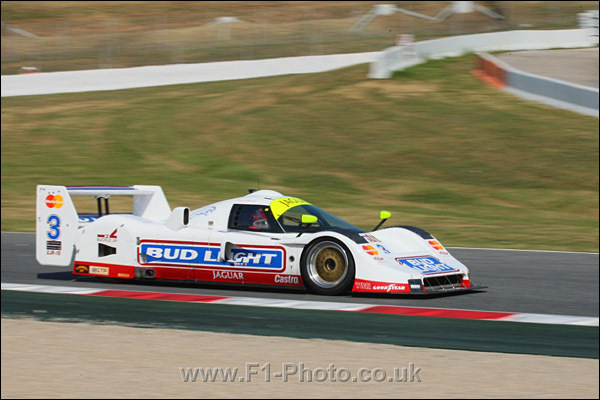 The problem turned out to be a broken crankshaft and would prove to be insurmountable at the circuit, and the Bud Light XJR16 would unfortunately be unable to race. 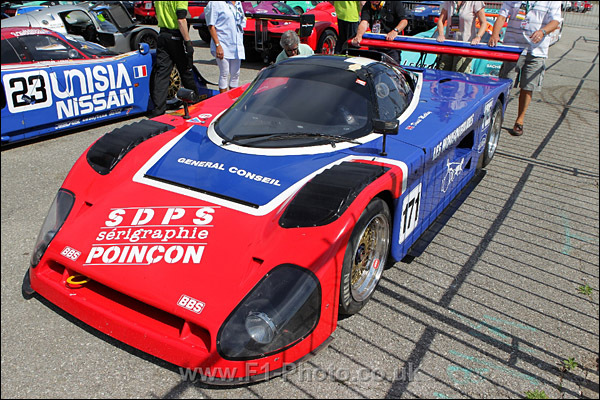 It would be an early start for the Group C runners on Sunday, with the first of the two races being the second race on a packed schedule, with a start time of 09:45. 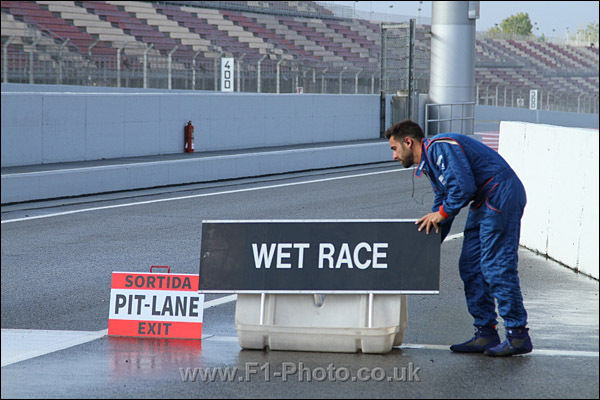 More significantly, the field was facing a damp track after overnight rain and the race was officially declared wet before the start. It was, however, not damp enough for cut Avons and the entire field opted for slicks. The front row saw the Jaguar and the Mercedes side by side, with Tandy’s Spice and Kubota’s Nissan right behind. The field set off for its two pace laps – the clock beginning to count down at the end of the first – and, after the pace car had peeled off, approached the lights for the start of the race proper. From this point on, the action came thick and fast. 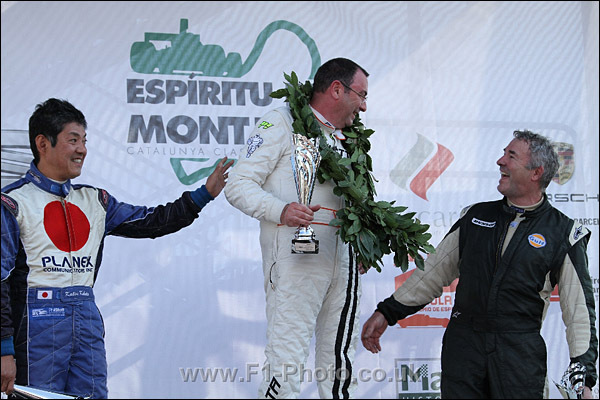 Carrying the fight to the Jaguar immediately, the Mercedes of Aguas took advantage of the conditions to find a way past and ended the first green lap with a lead of half a second. In third place by this point was Michael Lyons, who had made a storming start in the Gebhardt to pass four cars in the first three miles. But it was neither Tandy nor Kubota who was pushing him hard in fourth; instead his pursuer being the yellow Nissan RC90 of Berridge. 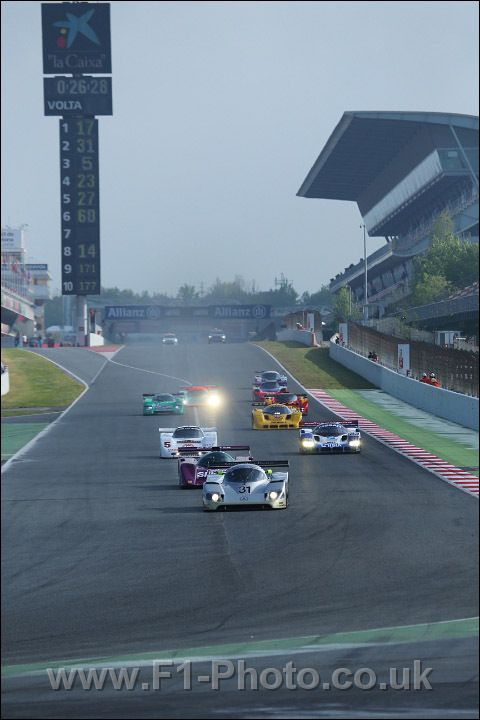 Tandy was a second and a half adrift of this battle in fifth, with Rickenbacher sixth, Methley up to seventh in the C2 Spice, Kubota – who had had a terrible start – in eighth, Dreelan ninth and Frank Lyons 10th. 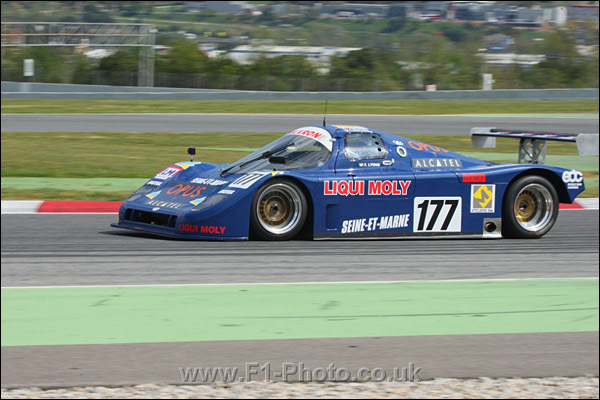 Having taken the lead, Aguas found that shaking off the deposed XJR14 would be easier said than done and the two cars were nose to tail for the next few laps, giving the watching fans some fabulous entertainment. 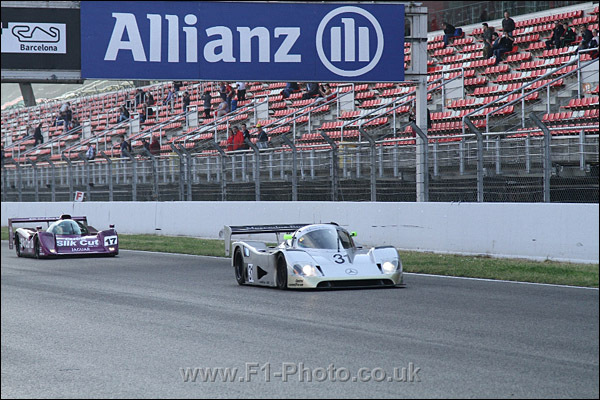 As these two cars pulled away at the rate of six seconds per lap the Gebhardt was holding onto third, but the fourth-placed Nissan was coming under increasing pressure from Tandy’s Spice and the position changed hands on Lap 6. Tandy carried his momentum forwards and rapidly closed the gap to the C91 before taking third just before the end of Lap 7. 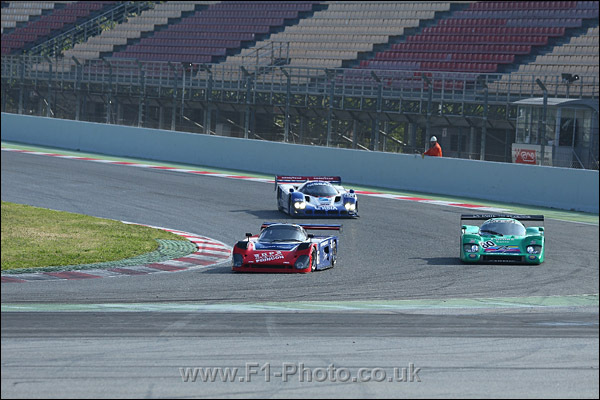 Methley, meanwhile, had taken his C2 Spice past the Cheetah and up to sixth overall on Lap 5, but could do nothing to hold back the recovering Nissan and its fired-up Japanese driver a lap later. 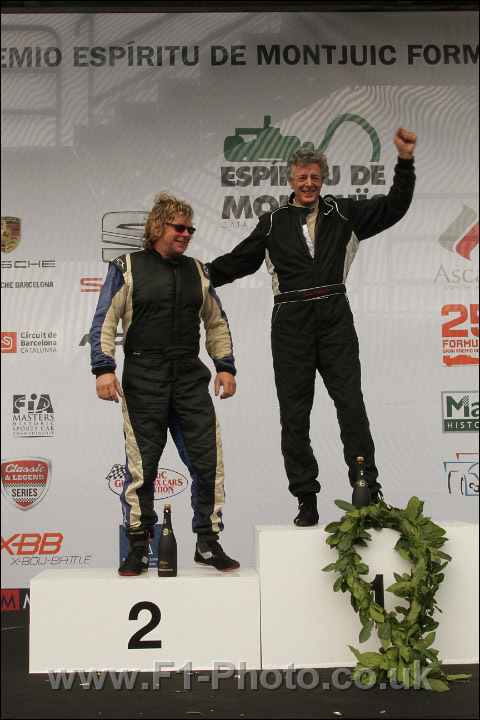 Further back, Dreelan and Frank Lyons were fighting for ninth, but the speed of the C1 Porsche enabled the Irish racer – who was taking no chances on a still-tricky surface – to gradually pull away. But while the pressure was now off for Regout, who ended Lap 11 with a 51-second lead, the same could not be said for the rest of the field and the fight for second was in the process of heating up. 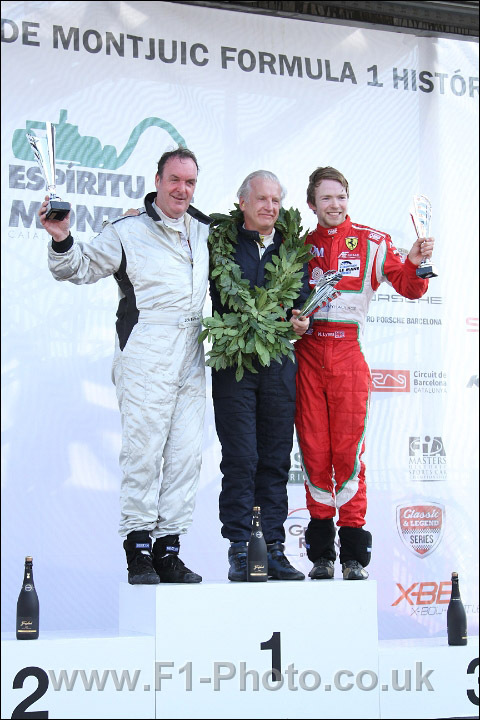 As his tyres deteriorated, Michael Lyons was unable to hold onto his place and the two Nissans had found a way past by the time the lead changed. Berridge held third with Kubota fourth, but on Lap 13 Tandy’s nine-second cushion suddenly shrank to a second after he came upon the recover vehicle fiasco (see pic above) and the three cars were now separated by just two seconds. The Spice driver wasn’t phased by this and was able to stretch his advantage to four seconds over the next two laps, but Kubota was all over Berridge as the clock ticked down to three minutes. But not even a 1:42.506 from the Japanese (just a hundredth quicker than his opponent’s best, set two laps earlier) could unsettle the yellow car and the order remained unchanged to the flag. Regout took overall victory by a minute and 12 seconds, while Tandy had a seven second margin at the end as he took the C1 trophy. Kubota was fourth, second in C1, with Michael Lyons fifth, third in C3, Rickenbacher sixth, third in C1, David Methley seventh for his first C2 win, Tommy Dreelan eighth and Frank Lyons ninth. 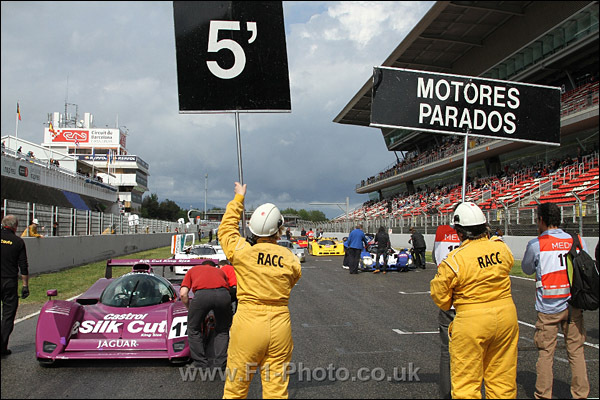 The second race would be the penultimate event of the meeting with a scheduled start time of 15:30, giving the crews about five hours to attend to their cars. 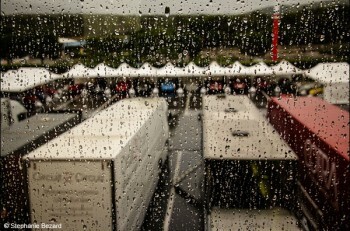 This time there would be no doubt as to tyre selection as rain fell across the track as the start time approached; but the skies were clearing as the pace laps commenced and the precipitation would soon be at an end. Unfortunately, the green Cheetah had not made the grid as a result of a broken water pipe and Eric Rickenbacker’s enthusiastic Swiss team would be mere spectators for this race. This time it was Christophe D’Ansembourg at the wheel of the pole-sitting Jaguar, while Kriton Lendoudis was in the Mercedes, but the wet conditions meant that they would not be able to make full use of the power from their engines and an understandably cautious start from both drivers allowed Katsu Kubota to slip by and take the lead in the #23 R90CK. By the end of the first racing lap, Kubota was 3.295s in the clear, while D’Ansembourg was starting to pull clear of Lendoudis, who himself had the Gebhardt of Michael Lyons filling his mirrors; the C91 inheriting the place following spins from the Spice of Steve Tandy and the Nissan of Gareth Evans, who were now in eighth and seventh places respectively. The leader continued to pull away by a second or two a lap on a rapidly drying track, with all drivers starting to look for wet patches to cool their tyres from Lap 5 onwards. As the race continued, it was clear that Kubota was in a class of his own and that only mechanical issues or a Safety Car were likely to rein him in. The car on the move further back in the pack, however, was the C2 Spice of David Methley, which had passed Tommy Dreelan’s Porsche on Lap 5 and was now closing on the Gebhardt at the rate of up to four seconds per lap; and a following Steve Tandy in the C1 Spice was unable to keep pace with the SE89C. Dreelan, meanwhile, was enjoying himself holding off Evans’ Nissan, and it would not be before Lap 12 that the C3 car found a way by. As the final few minutes of the race neared, Kubota had pulled out a lead in excess of 40 seconds, while D’Ansembourg was 20 seconds clear of Lendoudis. 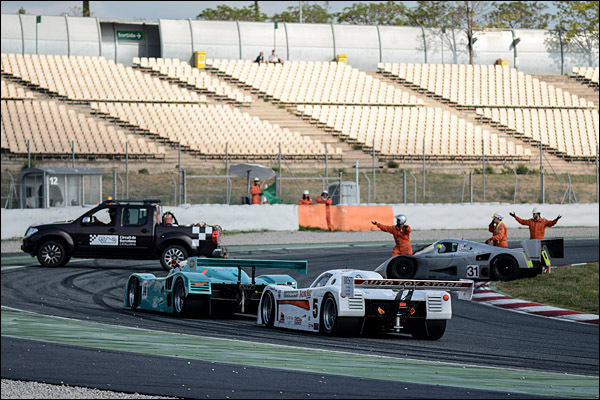 The Mercedes still had the Gebhardt -Michael Lyons keeping up a good pace despite having to deal with an obvious misfire – for close company and its Greek driver could by now also see the C2 Spice of Methley behind the red car. But Lendoudis was undaunted by this pressure and kept the two nimbler cars in his wake, even though less than two seconds covered all three. Still very inexperienced in the powerful C11, he had handled the tricky conditions impressively and was not in the mood to yield any ground to his pursuers. Towards the rear of the race, meanwhile, Dreelan was starting to come back at Evans and these two were separated by just a second. 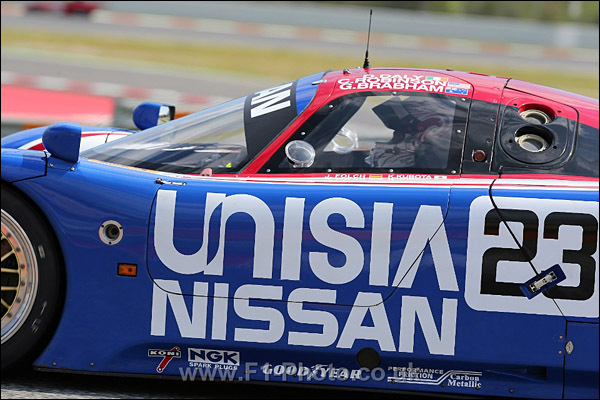 But nobody could do anything about Kubota in this race, and the blue and white Nissan crossed the line to take the win by more than a minute. 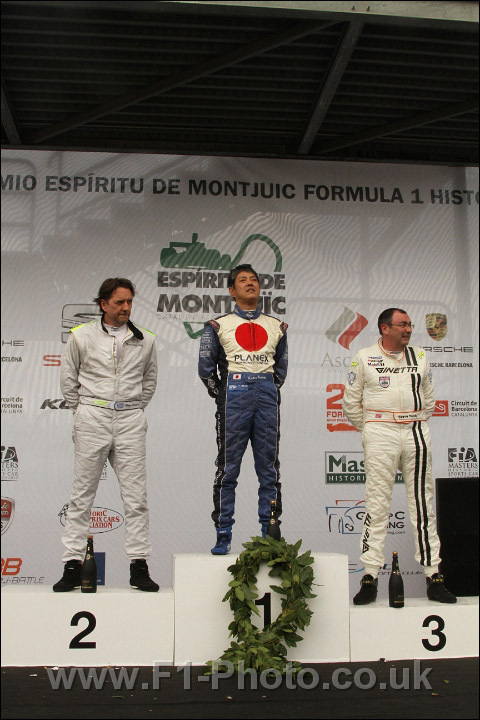 “Although it was a wet start, I took two cars at the start and was able to carry good speed into the last corner, which meant I could pass the Jag at the first corner of the second lap,” said Katsu. “After that I kept pushing hard for first few laps. 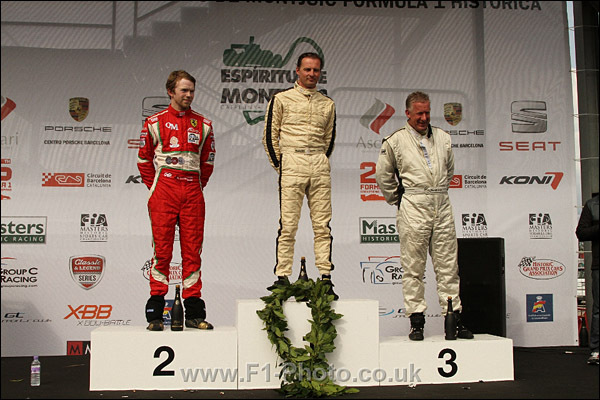 The car was a bit nervous in the corners in the wet and I had a few half-spins, but I managed to control them well. D’Ansembourg finished second in his race debut in the XJR14, but his margin to third had fallen to just 12 seconds as Lendoudis put his foot down to keep position. “I’ve had a fantastic weekend at Barcelona,” said Kriton. 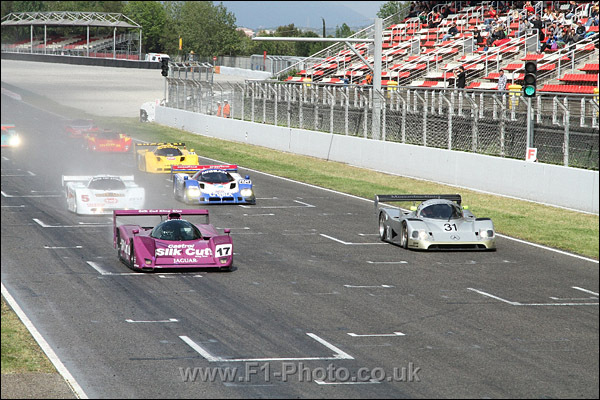 “The sight of so many historically important cars on the track, be it F1, Group C or the many others, is amazing! Lyons was just half a second behind at the flag in his V7 Gebhardt, while Methley ended a fine drive less than a second adrift of the Gebhardt. Steve Tandy was sixth, 12 seconds further back. Kubota’s pace had been enough to lap both Evans and Dreelan as their fight continued, but the Nissan prevailed over the Porsche by just four-tenths of a second. It wasn’t such an exciting race for Frank Lyons, however, as a fuel pick-up issue left him a long way off race pace and five laps down by the flag. 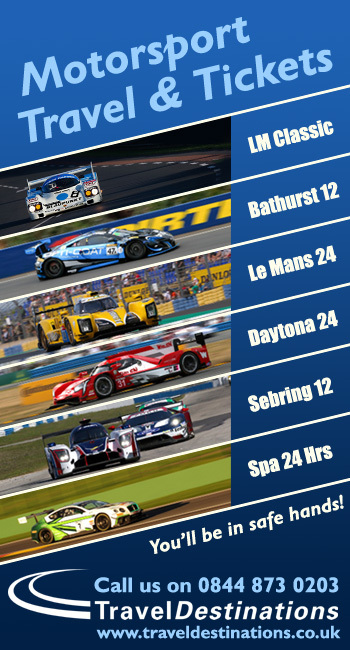 The series now moves on to the very different surroundings of the hills of the Ardennes for the Spa Classic, where a larger field will battle for honours in the first of the season’s hour-long races.